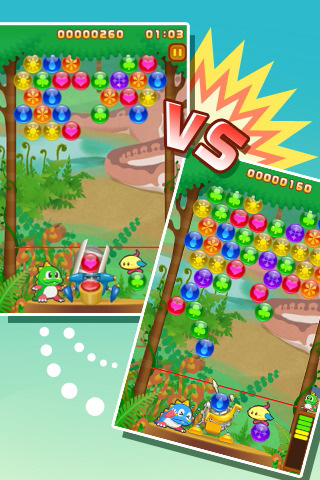 Bust-A-Move is the official TAITO game for the iPhone which sells for $4.99 in the App Store. No I’m not talking about that Young MC song from the 80’s. Bust-A-Move (also known as Puzzle Bobble in Japan) the classic puzzle shooter that was wildly popular in the 90’s and was brought to the U.S. market by Neo Geo. The game has since been ported over to numerous consoles and been cloned numerous times, spawning its own sub-genre. The iPhone version is on the pricey side but if you ever played the arcade version of Bust a move, you’ll probably agree that spending $5 in quarters in versus mode was not uncommon. TAITO have done an amazing job bringing Bust-A-Move to the iPhone. The mobile version has many of the familiar features of the console and arcade versions, including the addictive soundtrack, fun characters, and cranck style slingshot shooter gameplay. Graphics are super clean and polished although not perfect. There is a tiny bit of a performance issue if you’re running too many apps in the background. If you notice that slight un-smoothness while playing be sure to do a restart and close other running apps and should be fine. All the cute characters, sound effects and graphics are all there. Gameplay is enjoyable and the aiming mechanism works quite well on the iPhone with almost identical look and feel, and functionality to the arcade version. The clicking audio response while moving the slingshot left and right helps give a sense of accuracy when aiming. If you prefer you can go into the options and use “tap shot” instead. Personally, I much prefer the slingshot approach. It feels natural especially when bouncing off the walls. You can play in Story Mode, Challenge Mode or Vs. Mode. A brand new Cooperative mode is available for an extra $0.99. Achievements and scores are implemented via OpenFeint. To play Vs. Mode, Bust-A-Move needs another iPhone and hooks you up using Bluetooth. This actually works very smoothly, but does not work on the original iPhone or iPod touch. So as long as you have an iPhone 3G, 3GS, or iPhone 4 you’ll be fine. There are 2 in-app purchases in Bust-A-Move, each selling for 99 cents. Puzzle Mode gives you 50 stages to play, and Cooperative Mode. In Cooperative Mode you play in landscape view using two launchers, one operated by Bob, the second by Bub. 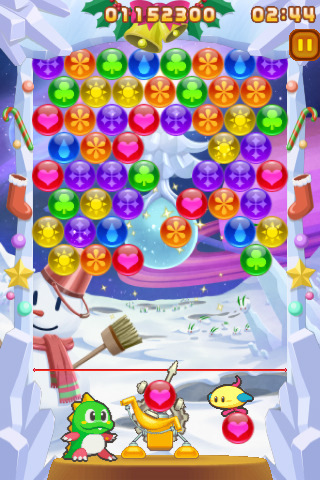 This mode reminds me a lot of the Arcade vs. Mode, except for that you are working together to clear the bubbles. You could in theory operate both yourself, though its more fun to play with a friend. For 99cents this is a good buy, though perhaps it should just be included with the game. I really hope that TAITO releases Bust-A-Move for the iPad. On the bigger screen, Cooperative mode would really be amazing. Overall, Bust-A-Move is a serious release with lots of fun and replay-ability. Anyone who’s ever played the game before will really love this iPhone version of Bust-A-Move. The price is a little steep for casual fans, but if you’re into the game, buy it. You won’t be disappointed. Bust-A-Move will be one of those iPhone games that you will have a really hard time deleting. Sample the free version of Bust-A-Move on your iPhone. AppSafari review of Bust-A-Move was written by Joe Seifi on February 5th, 2011 and categorized under App Store, Featured, Fun, Games, Puzzler. Page viewed 4670 times, 1 so far today. Need help on using these apps? Please read the Help Page.